Xiaomi's Black Shark gaming phone goes official with 5.99-inch display, Shark GamePad, Liquid cooling and 8GB RAM. Xiaomi-backed Black Shark gaming company has today unveiled the Black Shark phone as the first gaming smartphone from the company at an unveil event in Beijing, China. It comes with 18:9 display, Snapdragon 845 processor, 8 GB of RAM, Dual cameras, and 4000mAh battery. The major highlight of the phone is that users can attach a Bluetooth gaming controller to it for true gaming experience. The Black Shark features a 5.99-inch Full HD InCell display that supports resolution of 1920x1080 pixel and an aspect ratio of 18:9. The bezel present below the display of the phone is equipped with a fingerprint sensor enabled home button. It measures 161.6 x 75.4 x 9.25mm and it weighs 190 grams. The Black Shark gaming phone comes with the ability to support a Shark GamePad controller which turns it into a gaming beast. The left side of the phone has a dedicated Shark Key that allow users to access impressive gaming zone. It packs a Qualcomm Snapdragon 845 chipset. To control the internal temperature, the handset features a multi-layer cooling system that includes high thermal conductivity copper alloy substrate, nano-composite graphite, heat pipe and liquid cooling that can bring down the temperature of the device by 8 degrees by improving the CPU cooling efficiency by 20 times. It's available in two variants: 6 GB of RAM + 64 GB storage and 8 GB of RAM + 256 GB storage. It houses a 4,000mAh battery that is equipped with 18W fast charging support through Quick Charge 3.0. The handset is loaded with a gaming focused JOY UI, a customized Android Oreo ROM that includes some core features of the MIUI. While gaming, the fingerprint sensor can be swiped to Shark Dock that includes handy features like silent mode, DND and more. The Black Shark includes a dual camera setup that features an f/1.75 aperture 12-megapixel primary sensor with a pixel size of 1.25micron and an f/1.75 aperture 20-megapixel secondary sensor with a pixel size of 1.0micron. The dual camera setup is equipped with features like dual-tone LED flash, PDAF, HDR, Portrait Mode and Panorama. For snapping selfies, it houses a 20-megapixel camera with f/2.2 aperture that offers features like intelligent beauty and 4K video shooting at 30fps. The cameras of the phone are Black Shark Phone are powered by an independent image processor by Pixelworks. The connectivity features available on the Black Shark gaming include USB-C, Wi-Fi 802.11ac, 2 x 2 MIMO, Bluetooth 5.0, 4G VoLTE, dual-SIM support, GPS, APGS, GLONASS. 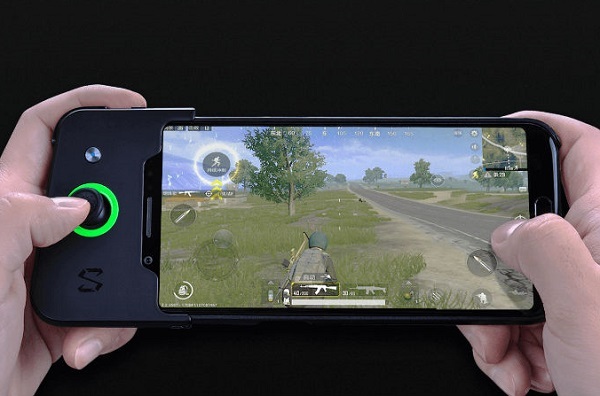 The Black Shark Phone metamorphoses into a true gaming device by connecting its Bluetooth-enabled gaming Shark GamePad to the top portion of the phone. It is packed with a joystick, a trigger and a 340mAh battery that offers 30 hours of power. The gamepad can be used with other Android devices too that support Bluetooth 4.0 and Android 4.4 or above. The 6 GB RAM + 64 GB storage and 8 GB RAM + 256 GB storage editions of the Black Shark gaming phone are respectively priced at 2,999 Yuan (~$477) and 3,499 Yuan (~$557). The Shark GamePad can be availed with a price tag of 179 Yuan (~$29). The reservations for Black Shark will start today in China starting at 6 PM (local time) through Xiaomi Mall, Jingdong and Mi Jiapin. It will be available for buying starting from April 20. It can be bought in colors like Midnight Black and Dark Grey.